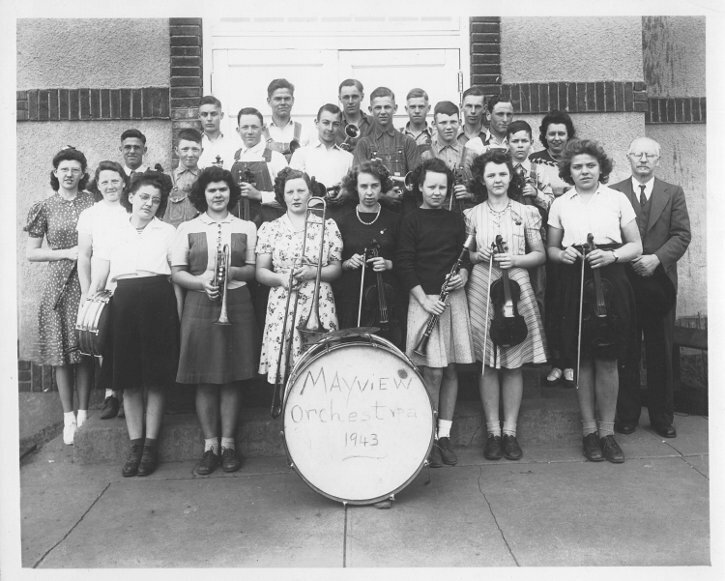 Front Row, from left to right: Daisy Bell Vorwark (wearing glasses and holding a snare drum; Dorothy Lorraine Fiegenbaum (with a coronet); Lydia Katherine Begemann (with a trombone); Marjorie Miller (with a violin); Betty Carl (with a clarinet); Elizabeth Rinne (with a violin). 2nd Row, left to right: Emma Ellen Sander (in the print dress with the flute); Dorothy Grace Sander (dressed in white); David Nolte (overalls and chambray shirt); August William Begemann (overalls, white shirt, and violin); Bobby Goetz (white shirt with a horn); Roger Nolte (dark shirt, overalls, horn); Aubrey Nolte (with a violin); Hubert West; Ernest Willer, the music teacher. 3rd Row, left to right: J. W. Fiegenbaum (wearing glasses); Richard? Vorwark; Earl Struchtemeyer (white shirt, overalls & horn); L. H. Tempel (dark shirt & horn); Julius Rechtermann, Jr.; Raymond Fieth; Norman Tempel; Emma Jean Schowengerdt [spelling?] (wearing a necklace). In our family, whenever stories were told of the musical education of my father and his siblings, someone was sure to mention Mr. Ernest Willer and his signature phrase (always spoken with a German-American accent): "All together now, one at a time." The same stories also made clear that neither J. W. nor Dorothy Fiegenbaum contributed one iota, musically, to the orchestra. The instruments they are holding were strictly symbolic.